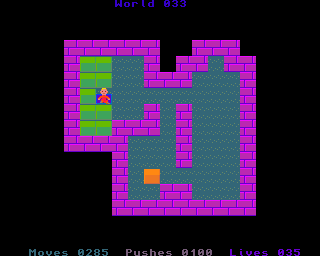 World thirty-three is with ten normal boxes, but not hard. Go DOWN, RIGHT, DOWN, DOWN, DOWN, DOWN, LEFT and push DOWN. Go RIGHT, UP, UP, UP and push LEFT. Push DOWN, go RIGHT, UP, UP, UP, LEFT and push DOWN. Push LEFT, LEFT, LEFT, LEFT, LEFT, LEFT and LEFT. Go UP, LEFT, push DOWN and DOWN. Go RIGHT, RIGHT, RIGHT, UP, RIGHT, RIGHT, RIGHT, RIGHT, RIGHT and RIGHT. Go DOWN, DOWN, LEFT and push UP. Go RIGHT, UP, push LEFT, LEFT, LEFT, LEFT, LEFT, LEFT and LEFT. Go UP, LEFT, push DOWN and DOWN. Go RIGHT, RIGHT, UP, RIGHT, RIGHT, RIGHT, RIGHT, RIGHT, DOWN, DOWN and LEFT. Push UP, go RIGHT, UP, push LEFT, LEFT, LEFT, LEFT, LEFT, LEFT and LEFT. Go UP, LEFT and push DOWN. Go RIGHT, RIGHT, RIGHT, RIGHT, RIGHT, RIGHT, RIGHT, RIGHT, RIGHT, DOWN, DOWN, DOWN, DOWN and LEFT. Push UP, UP, UP, go RIGHT and UP. Push LEFT, LEFT, LEFT, LEFT, LEFT, LEFT and LEFT. Go UP, LEFT and push DOWN. Go RIGHT, RIGHT, RIGHT, RIGHT, RIGHT, RIGHT, RIGHT, DOWN, DOWN, DOWN, DOWN and LEFT. Push UP, UP, UP, go RIGHT and UP. Push LEFT, LEFT, LEFT, LEFT and LEFT. Go DOWN, LEFT, push UP, UP, go RIGHT, UP, push LEFT and LEFT. Go RIGHT, RIGHT, DOWN, DOWN, RIGHT, RIGHT, RIGHT, RIGHT, RIGHT, DOWN, DOWN, RIGHT, DOWN, DOWN, DOWN, DOWN and LEFT. Push UP, UP, UP, UP, UP, go RIGHT and UP. Push LEFT, LEFT, LEFT, LEFT, LEFT and LEFT. Go DOWN, LEFT, push UP, UP, go RIGHT, UP and push LEFT. Go DOWN, DOWN, RIGHT, RIGHT, RIGHT, RIGHT, RIGHT, DOWN, DOWN, DOWN, DOWN, RIGHT, DOWN, DOWN and LEFT. Push UP, UP, UP, UP and UP. Go RIGHT, UP, push LEFT, LEFT, LEFT, LEFT and LEFT. Go DOWN, LEFT, push UP, go RIGHT, UP, push LEFT and LEFT. Go RIGHT, DOWN, RIGHT, RIGHT, RIGHT, RIGHT, RIGHT, DOWN, DOWN, DOWN, DOWN, DOWN, LEFT and LEFT. Push UP, UP, UP and UP. Go DOWN, DOWN, DOWN, DOWN, RIGHT, RIGHT, UP, UP, UP, UP and UP. Push LEFT, LEFT, LEFT and LEFT. Go DOWN, LEFT, push UP, go RIGHT, UP and push LEFT. Go DOWN, RIGHT, RIGHT, RIGHT, DOWN, DOWN, DOWN, DOWN, LEFT, LEFT and UP. Push RIGHT, go DOWN, RIGHT, push UP, UP and UP. Go DOWN, DOWN, DOWN, DOWN, RIGHT, RIGHT, UP, UP, UP, UP, UP and LEFT. Push LEFT, LEFT, LEFT, LEFT and LEFT. Go RIGHT, RIGHT, RIGHT, RIGHT, DOWN, DOWN, DOWN, DOWN, LEFT, LEFT, DOWN, DOWN and RIGHT. Push UP, UP, go LEFT, UP and push RIGHT. Go DOWN, RIGHT, push UP, UP and UP. Go DOWN, DOWN, DOWN, DOWN, RIGHT, RIGHT, UP, UP, UP, UP, UP and LEFT. Push LEFT, LEFT, LEFT and LEFT. Congratulations. You have completed world thirty-three. Get ready for world thirty-four.